How do you kill two birds with one stone? In 2013, Southeastern University, Florida, one of many higher-education facilities around the world to adopt Cache-A archive appliances, did just that, when it installed Power-Cache, with an LTO-6 Library24 expansion chassis. In one fell swoop, Southeastern harnessed the appliance’s network attached storage (NAS) capabilities, to share materials between editorial, and its cavernous archiving to provide longterm asset protection. Based in Lakeland, Florida, Southeastern University is a Christ-centered academic institution, founded in 1935. Its popular Communications Department equips students with hands-on training in order for them to take up successful careers in broadcasting, journalism, public relations, film production and the theatre. 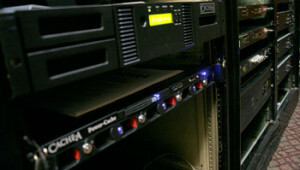 Starting as freshman, they gain experience using state-of-the-art broadcasting equipment in a newly-overhauled HD facility, with Power-Cache and Library24 LTO-6 systems at the heart of the workflow. 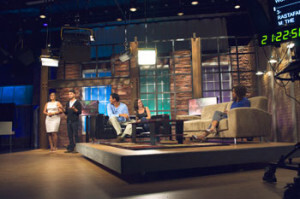 During their studies, across a range of broadcasting degrees, Southeastern University students have ready access to a 2,500sq/ft production studio, Panasonic AK-HC3800 HD studio cameras, AJA KiPro recorders, a handsomely-equipped control room with a Ross Carbonite 2 MLE switcher, FCP X editorial and VFX and motion graphics software. Using these facilities, they are charged with delivering broadcast-quality programming, such as the weekly RAW TV (Real & Willing Television) talk show, which is broadcast over national TV networks, and available on-demand via iTunes U. The facilities are also used to produce a range of promotional videos, chapel services, student concerts and shows. 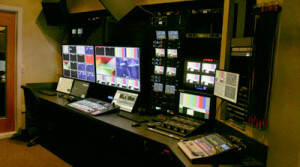 To keep pace with advances in the broadcast industry, and under Fritzsche auspices, Southeastern University undertook a major upgrade of its TV and broadcast learning facilities in 2013. The department originally opened in 1993, was upgraded to digital SD in 2005, and most recently was overhauled to full HD capability. But unlike commercial operations, the university had to plan this evolution on a restricted budget. Fritzsche says he undertook considerable research into a host of solutions for Southeastern University’s equipment needs – talking to various RAID, SAN, NAS and tape-drive system manufacturers. 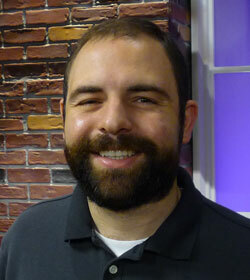 With the assistance of AV equipment specialist Encore Broadcast Solutions, in Orlando/Winter Springs, Florida, which had won the bid for the studio upgrade, Fritzsche was introduced to Cache-A’s LTO-6 product line, and discovered more than he had perhaps expected. “During my research, what surprised me about archiving was that most companies did not sell one complete off-the-shelf solution. I realized that I would have pick-and-choose hardware and software from different companies, and quite frankly I didn’t have the time, nor the budget, for that. Then I started looking at Cache-A and got another, but altogether more pleasant surprise – that their products combine RAID0 or RAID5 NAS capability with the latest LTO-6 generation storage, in one simple, expandable package that could grow with us. With the HD upgrade complete, Southeastern’s Power-Cache/Library24 combination is used to ingest ProRes 422 footage directly from the KiPros via GbE, with material then being shared off the internal RAID by as many as ten FCP editors via Gb Ethernet. Students also load and offload material from portable harddrives. When projects are completed in editorial, the final editorial files are re-ingested to the Power-Cache and reside in RAID repository until the end of semester, when all assets then get archived in LTFS to LTO-6 tape. Broadcast professors also use the system to access files and grade student projects. There’s even the distinct possibility of Southeastern University generating a return on its investment, as the studio facilities, including LTO-6 archiving, are available for rental during the summer months. “Overall, Cache-A delivers a well-rounded archive solution that ticked all of my boxes. You’d be hard pressed to find anything as versatile, with so many features and support, from any other manufacturer,” he concludes.